See something you like? Want to own a print of it? Prints can fill that blank space on your wall at home or office with some great scenery. They make great conversation pieces. Prints also make great gifts. Stuck trying to figure out what to buy your relatives for a birthday or holiday? Order them a print! 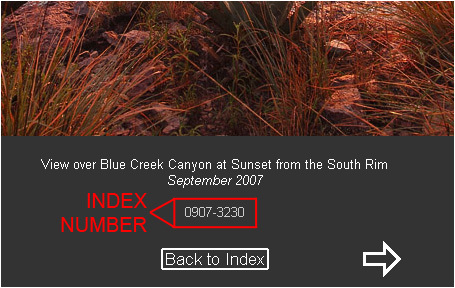 1) Make note of the index number for each image that you're interested in. See the section below for instructions on where to find this number. 2) Decide on the sizes of prints that you want. The available sizes are provided below. I will respond to your email with a total price and instructions on how to make payment. Prints are sold loose (unmatted and unframed) and will be shipped in an acid free plastic bag along with a stiff backing board. If multiple prints are ordered, they will be shipped together in one package. Each print is made by me personally, and I take the time to look at them carefully to ensure they are free of defects. I sign each print using an acid-free pen. The details of the photo (e.g. location, date, etc.) are included on a separate card along with the print. Please contact me with the required information (see numbered list above), and I will respond with the total price of your request. Payment in full is required prior to shipment. I accept checks (from within USA only), money orders, Paypal, and Google Wallet. Checks will require an additional amount of time to clear. Paypal payments are only accepted from individuals with verified addresses.